Just when we thought that winter was nearly over, it rained and hailed and rained some more. We are back to single digit temperatures (better than zero, I suppose) and everything is just gray and gloomy. But not the flowers. 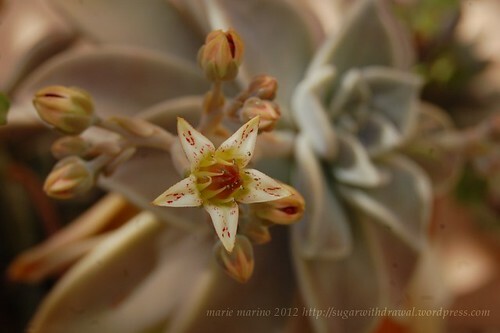 They are blooming like spring is already here…. Crazy Conversations: Money or Happiness? The Babii came home from school the other day all worked up. Her class had a debate on which was more important, money or happiness. 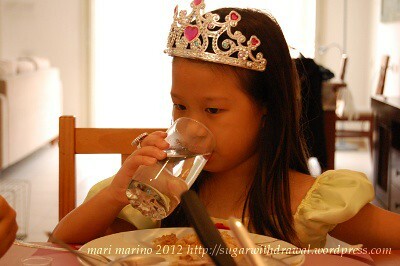 Apparently, a good number of her classmates chose happiness, and she was incredulous. It started out with two piggies in 2009. 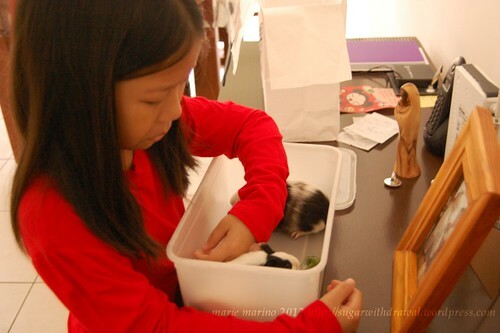 The Babii wanted a pet and ended up with two guinea pigs. 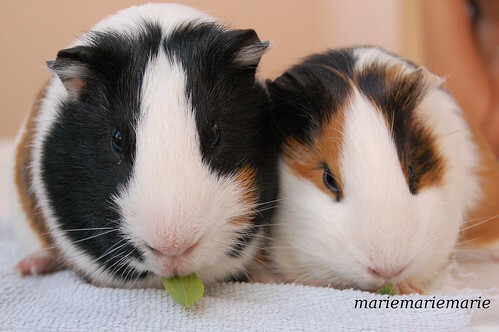 Unfortunately, we realized belatedly that one of the piggies was a “he” instead of a “she,” and a few months later we had baby piggies! At that point I established a house rule: two piggies only. The Babii had to give away the baby piggies. After a lot of tears and drama, that is. 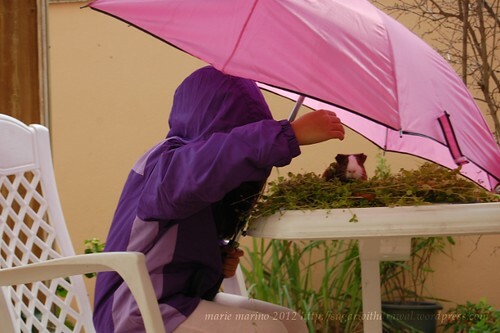 Piggies are quite low maintenance compared to cats and dogs. They are vegetarian, like to burrow in their little caves and pretty much entertain themselves as long as you give them enough space. After a while of getting used to your presence, however, they can get pretty demanding. In our case, as soon as they hear the Babii coming down the stairs early in the morning, they start squeaking and hooting. Squeak! Squeak! Give us our breakfast! The squeaking can get pretty insistent, especially when they hear a bag rustling or smell the vegetables being chopped in the kitchen. (Apparently, they have a very strong sense of smell.) They also like to perch on their bowl and give us forlorn looks, especially when the Babii is at school, because they know that their squeaking doesn’t work on the adults. They have also learned a new trick: turn over the food bowl so the humans will give more food! We learned that pretty fast. 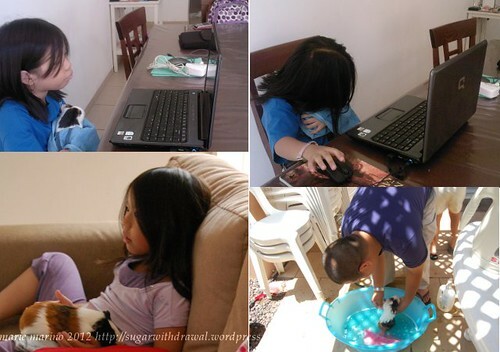 A year passed without another set of babies, and we all heaved a sigh of relief. I was in favor of having Mudbud (the male) neutered, but R was more of a “let’s not interfere with nature” kind of guy. Looking back, perhaps it was already an indication that something was wrong with Mudbud. A few months later the incident with the dog happened, and then it was good bye for him. As if that wasn’t bad enough, she became pregnant again! With quadruplets! So technically, we now have seven piggies. 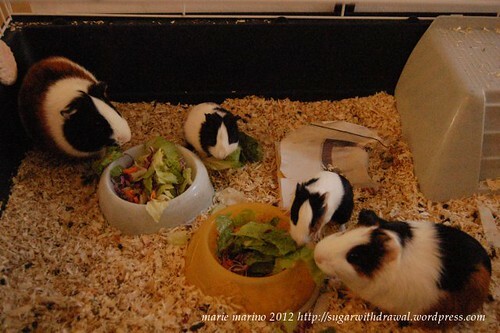 Theoretically, we are keeping only four: Miss Piggy, Mikeru (the female who turned out to be male), Coco their eldest offspring (male), and the sole female piggy of the last batch who still remains unnamed. (So much for house rules.) We will be keeping the males and females in separate cages to avoid further….er…. procreation. 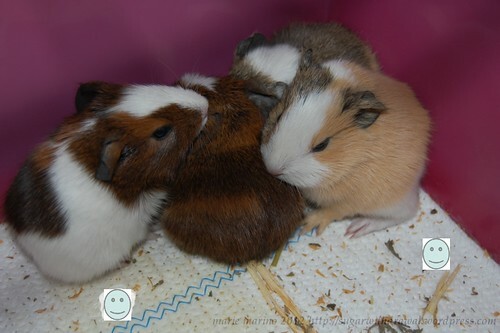 The other three males we are giving away. The Babii has been forbidden from naming them, so at the moment they go by: the brown one, the caramel one, and the gray one who looks like a rat. 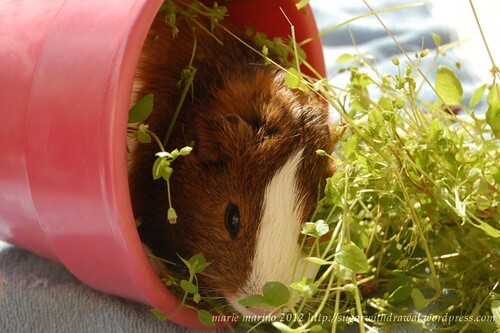 Once a piggy gets comfortable with their surroundings, their personalities start to show. Mudbud was a glutton and quite daring (piggies tend to be timid and high strung). He would brave the presence of humans for the sake of food. (And hence the failure to run away quickly when the dog came.) Miss Piggy is domesticated but always suspicious. She runs away at the smallest things. Mikeru lives on the wild side. He is not used to human touch, mostly because when he arrived, the Babii was still so heartbroken over Mudbud that she left him alone for a long time. Coco is slowly getting used to people, and probably feels quite harassed when the Babii plays with him. The babies are also starting to show their personalities and they are sooooo cute. But NO. They really have to go. I am not about to start a piggy farm here (besides, I don’t want to be known as the “pig lady”). Anyone want to adopt some piggies?